We all know of the thirsty crow that came across a half-empty pitcher of water. It didn’t give up but started filling the pitcher with pebbles. It quenched its thirst when the water rose to a point that could be reached through its beak. This well-known fable emphasizes the importance of perseverance; of not giving up even when the going gets tough. Well, as a new entrant to the field of e-learning, you might be struggling to grasp and make sense of the concepts lying tantalizingly just out of your reach. This blog will help you gather the pebbles – basic terms commonly bandied around in the field of e-learning – you need to become familiar and confident about your work. Get a grip on them and you will be good to go. Let’s start at the very beginning – as all good things start – with an e-learning course. An e-learning course is a component of Computer-based training (CBT). It is often part of a training program, delivered to learners on their computers. 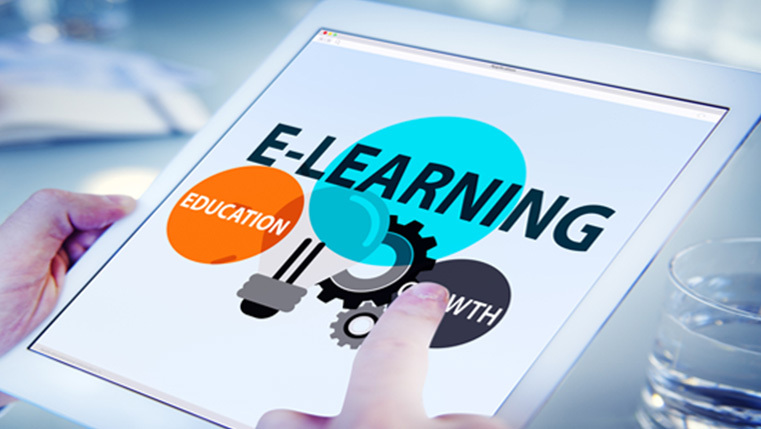 eLEARNINGNC defines e-learning as learning utilizing electronic technologies to access educational curriculum outside of a traditional classroom. An e-learning course also includes auditory and visual elements such as narration, GUI (Graphical User Interface) images, animations, videos, etc. Learning is made engaging through the use of interactivities. Learner progress is tracked through assessments and the course is wrapped in an API (Application Programming Interface: an interface to help one program communicate with another) such as SCORM or Tin Can to host it on a Learning Management System (LMS) from where it can be accessed by learners. 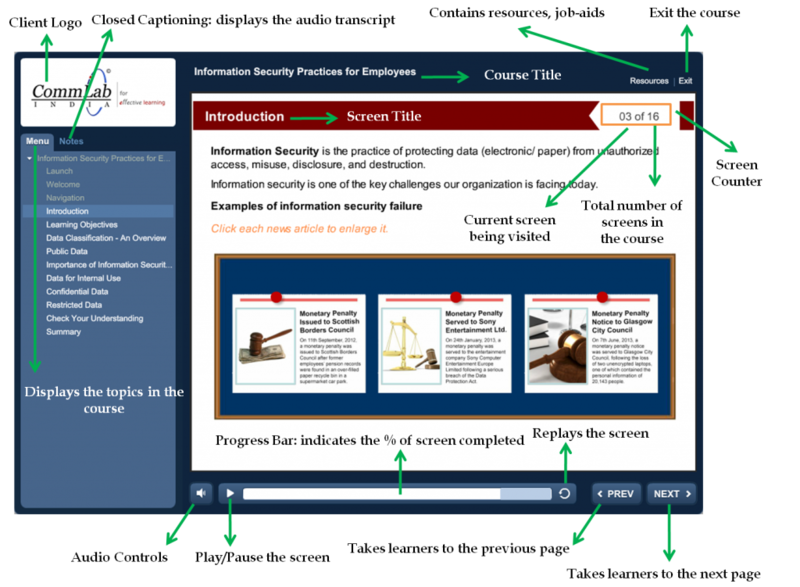 Let’s now take a closer look at the individual elements that constitute an e-learning course. E-learning courses lack the stimuli of an instructor, discussions and debates with peers. Interactivities step in to fill this void and help learners participate in the course, thereby providing engaging learning experiences. Interactivities need to be decided keeping in mind the technical constraints and background of the target audience. Example: If the course is for factory workers with limited access to computers, simple interactivities such as click on tabs will suffice. Millennials on the other hand are happy with complex interactivities such as gamified scenarios. As the Alice of ‘Alice in Wonderland’ famously remarked, “If you don’t know where you’re going, any road will take you there”. To avoid this predicament, e-learning courses state the learning outcomes in unambiguous terms, right at the outset. Benjamin Bloom, an educational psychologist classified learning into 3 domains – Cognitive, Psychomotor, and Affective. The cognitive domain is further divided into 6 levels, with action verbs to set specific learning objectives for each level. Presented through single/multiple select, drag and drop, matching, fill in the blanks, puzzles, etc. It is recommended that the learning objectives, content, and assessments be aligned with each other to ensure a logical flow and easy comprehension. Instructional Design is the systemic process by which instructional materials are designed, developed, and delivered to ensure learning gaps are addressed. It involves identifying the skills/knowledge gaps of learners, developing instructional material, rolling out and evaluating the learning activity. Find more about instructional design here. Instructional designers develop instructional specifications (course) in accordance with adult learning principles, adhering to instructional design models. A model is a representation of reality; guidelines to specify how something is to be accomplished. Instructional design models are prescriptive, they provide instructional designers a framework to organize and structure the creation of instructional activities. We will take a brief look at 2 widely used ID models – ADDIE and SAM. ADDIE is an acronym for the 5 phases it encompasses: Analysis, Design, Development, Implementation, and Evaluation. A linear, waterfall model, it has been around since 1975 and was first used by the U.S. army. Animations, images, icons, templates, etc. Preparation Phase: In this phase, the project development team gathers complete background information about the e-learning. Iterative Design Phase: In this phase, after a detailed kick-off meeting to orient everyone involved in the project, the functional prototype is developed and sent for the client review. Iterative Development Phase: In this phase, feedback is incorporated and the prototype is scaled up to develop the course. It is constantly evaluated, changes implemented and the course is rolled out. The USP of SAM is its collaborative nature. At every point during the instructional design process, the product is continually analyzed and evaluated to accommodate instant corrective actions and ensure issues don’t snowball. Hope this blog on the basics of e-learning has started you off in the right direction. We will be back soon with the next post in this series on instructional strategies.